Victoria & Albert: How does it all end? Watching the new season of Victoria, the young queen played the beautiful Jenna Coleman and Prince Albert by the equally gorgeous Tom Hughes, I find myself wondering how it all ends. How does this tender young queen, seeking out her own voice, come to spend so much of her life in widow’s black? When does Jenna Coleman’s lovely Queen Victoria turn into Judi Dench’s aging powerhouse? Albert lives until 1861, at which point he dies at the age of 42, of what was probably stomach cancer. Victoria, who herself said she ‘moved not a finger, didn’t put on a gown or bonnet if he didn’t approve it,’ was devastated. According to HistoryInAnHour.com the whole of England went into mourning, sharing the queen’s pain in an outpouring of grief that wouldn’t be seen again until the death of Princess Diana 136 years later. Victoria would reign another forty years after Albert’s death. She never again wore anything but black. 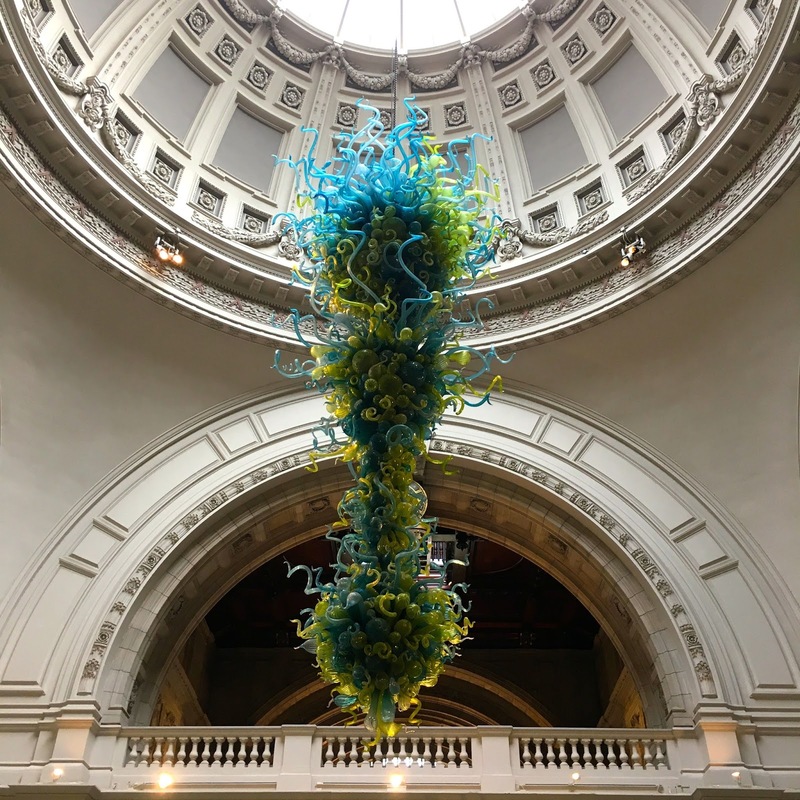 As far as the Victoria & Albert Museum goes—which we were lucky enough to visit last May when I took the photo of the eye-popping chandelier—the Queen officially opened the then-named South Kensington Museum in 1857. In 1899, in her last public outing, the Queen presided over the official renaming to the Victoria & Albert Museum. Queen Victoria died in 1901. She was eighty one years old. We were only in the V&A for about twenty minutes. My husband was much more entranced with the steam engines over in the Science Museum, but I got us in the V&A to see if the lunch options were any more interesting. We never got to the menu because the cafe was so big and noisy that we just went back to the Science Museum. Next time, I think I'll send him over to the Science Museum while I take more time at the V&A on my own. I stuck my head into the cafe because it was designed by William Morris but you're right, it was mobbed. I think that was the day we went to a little cafe where they made me a fried egg sandwich even though it wasn't on the menu. Heaven. I’ve never been at all as the only trips we have taken to England were spent in the rural areas. We’d get a car from Gatwick and head west but the plan is, one day, to stay a week in London and take public transport to see the museums . We flew into Gatwick as well! Funny, next time my husband and I want to hit the coast, and leave London for another trip. Dreams.